As seen in the December 2012 issue of Model Aviation. Those are the words that Pat Hartness used to describe the Triple Tree Aerodrome and the full-scale and model enthusiasts who use the facility for the many events. The RC helicopter community took those words to heart, and proved it with the first all-helicopter event to be held at the site. The author caught this aerial photo of the Heli Extravaganza from a Piper Cub, flown by Triple Tree staff member Pat Derrick. Many of the pilots who attended camped in RVs or tents by the pond or along the woods behind the flightline. The Heli Extravaganza was held September 21-23, 2012, on the same grounds as the popular Joe Nall and eWeek events. It was amazing that so many people attended and stayed until the end for this inaugural event. Was it the beautiful grounds and views, or the full-scale aircraft that buzzed around and took off every now and then that made them stay? Or was it the warm weather and the sun setting over the ponds in the evenings? To be at the Triple Tree Aerodrome and to fly there left many in awe, but it really all came back around to those three little words that Pat spoke of during dinner Thursday night: fun, fellowship, and hospitality. One more word should, however, be added to that equation: flying. The heli pilots love to fly! Women flew at the Heli Extravaganza, too! Amy Botos was at the flightline many times throughout the weekend flying her Blade 130 X and Blade mCP X helicopters. Steve Rogers, Clint Akins, and Darrell Sprayberry had been managing the helicopter section for the Triple Tree staff at Joe Nall since its flightline opened approximately four years ago, and for the last couple of years at eWeek. 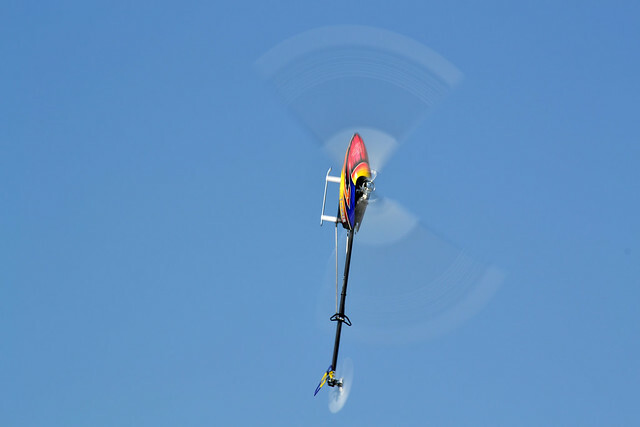 From the start, Steve and Clint, who both work for Castle Creations, and Darrell, a sponsored Castle pilot, Scale Nats CD, and well-known Scale helicopter builder, had expressed how much they would like to have an all-helicopter event at Triple Tree. The only issue was that there had never been an “unofficial” Triple Tree event held on the grounds. Peter Wales’ Vario 1/3-scale 300 C electric helicopter sets under one of the tents at the Scale flightline. Strong winds scaled back the amount of flying for Scale pilots. The three persisted, and it finally paid off. They were given the final okay by Triple Tree staff during Joe Nall 2012 to hold an event. There was little time to plan, set a date (and find a weekend that would not coincide with any other events), gather sponsors, and organize. Cortez Jenkins Jr. talks with other pilots about his Align T-Rex 600E’s setup. The helicopter community and its pilots are willing to offer advice to others, especially at fun, relaxed events such as this. Word quickly spread that the helicopter community would have its own fun-fly at the facility, but how the event would actually go—or what the turnout would be—would be unknown until it happened. This event was similar to other RC helicopter fly-ins. Pilots arrived and staked out their spaces with canopies and/or tables and chairs. Those who preregistered were eligible for raffle prizes that included a Gaui 200 helicopter kit combo, DJI Flame Wheel F450, and various items from KDE Direct and KBDD. Experience RC brought its mobile store trailer. Helicopter pilots were welcomed to the first Heli Extravaganza with banners at the front gate and the main flightline. The Triple Tree staff deemed the helicopter-only fun-fly an annual Triple Tree event. A dinner was held Saturday night for the pilots, and a live band provided entertainment. Professional and sponsored pilots flew during the day among beginner and intermediate pilots, and night rigs lit the sky in the evenings. Matt Botos, owner of Synergy Helicopters, helps a beginner with his training helicopter. The family- and pet-friendly Heli Extravaganza was an event for all skill levels. What made this event special was where it took place, the people who came to participate, and the reaction that the Triple Tree staff received. For those who had been to Triple Tree for other events, the scenery was nothing new—lush Bermuda grass, two ponds from which to fly floatplanes, a hangar with beautiful full-scale airplanes and RC aircraft and memorabilia, acres of field to fly any size aircraft, and even a bathhouse with marble sink tops and built-in hairdryers. Henry Caldwell’s KDS and T-Rex 700E helis were two of the many types flown at the Heli Extravaganza. Synergy and SAB Goblins, Horizon Hobby Blades, and Hensleit TDRs were also prevalent. But for the first-time visitor, there is something almost magical about this place and being able to fly here. For a smaller-scale event such as the Heli Extravaganza, it was a chance for the sponsored pilots to take a breather, relax, have fun, fly, and catch up with friends whom they don’t normally get to talk to when they’re under pressure at larger fun-flys. Hospitality reigned—and it didn’t go unnoticed. Steve Rogers said the Triple Tree staff was impressed. “The respect for the facility and the appreciation that was shown by the attendees made a very big impression on the staff and I was asked Friday night if I wanted to make this an annual event and naturally I said yes!” Steve said. Attendees gather to watch Synergy Helicopters team pilots fly. The Heli Extravaganza drew 101 registered pilots. The many canopies set up behind the flightline proved this was a successful event. These sentiments were echoed by those who attended. Kudos were given to the facility, to Steve, Darrell, and Clint for running the event so smoothly, to the 101 participating registered pilots, and to those who came as spectators. Many feel this is one of those events to watch, because it will quickly grow. Late Sunday at the field, as the sun began setting over the pond and the weekend wound down, the remaining pilots reflected on how neat it was to have the entire flying field to themselves, and what a great time it was just being there among the helicopter community. SAB Heli Division was one of many event sponsors. Several pilots flew Goblin helicopters in 630 and 700 sizes, and Experience RC sold Goblin kits in a mobile store trailer driven to the event from Livonia MI. It’s a tight-knit group that’s more like an extended family. Everyone is friendly and willing to help others—whether he or she is a beginner or a professional who has been flying for many years. This was something seen throughout the Heli Extravaganza. Multirotors were popular and many were equipped with cameras. Clint Akins used a gimbal to mount his GoPro camera on the DJI Flame Wheel F550. Wherever you looked, people were gathered in groups, laughing and smiling, watching fellow pilots fly, helping someone out with parts or advice, and having a great time. Everyone was relaxed and happy to be there. More pilots than usual lingered late into Sunday (which is unusual when many have to travel a great distance to home), not wanting it to end. Many said they would definitely be back next year. One of the two ponds on the property glistens behind a pilot’s helicopter and radio. Triple Tree spans 400 acres, with a 7,000-foot full-scale runway. That’s a lot of room for big heli maneuvers! Steve, Clint, and Darrell have begun thinking about next year and what they can do to bring more of the same feeling to the second annual event. Did the Heli Extravaganza meet the expectations of organizers? According to Steve, yes—and then some! Horizon Hobby’s Eric Meyers flies Rick Hayes’ Blade 500 X. Rick and fellow pilot Michael Fortune represented Horizon Hobby at the event and helped beginners. Blade helicopters of all sizes were displayed. Don’t miss the chance to visit the Triple Tree Aerodrome and Heli Extravaganza next year. Your membership connects you with exciting events! Your AMA membership is your ticket to participate in some of the more than 2,400 sanctioned model aviation events that happen each year! Without your membership, you're left sitting on the sidelines.